What will it take for manicures and pedicures for men to go mainstream? Perhaps finding a high-profile man to sing their praises. "I had an ex-girlfriend who ruined me in terms of my macho, ex-football-player self -- she turned me on to mani-pedis... Being a public figure, people talk smack about you, so I found this 24-hour mani-pedi place and go in the middle of the night. It’s this guilty pleasure I have. Look, manis are good, but pedis -- there’s something... transformative." We have waxed similarly about transformative powers of a good pedicure, but it's rare to hear the words from a man's mouth. But perhaps we shouldn't be surprised -- Booker knows a thing or two about personal style, having undergone various fashion interventions over the years. He told Menswear magazine that his staff helped him improve his suits, avoid faux pas like Speedos and even eliminate unflattering pleated pants from his wardrobe. He also aspires to enhance his tie knot to Obama levels of perfection (the president fashions a mean dimple). 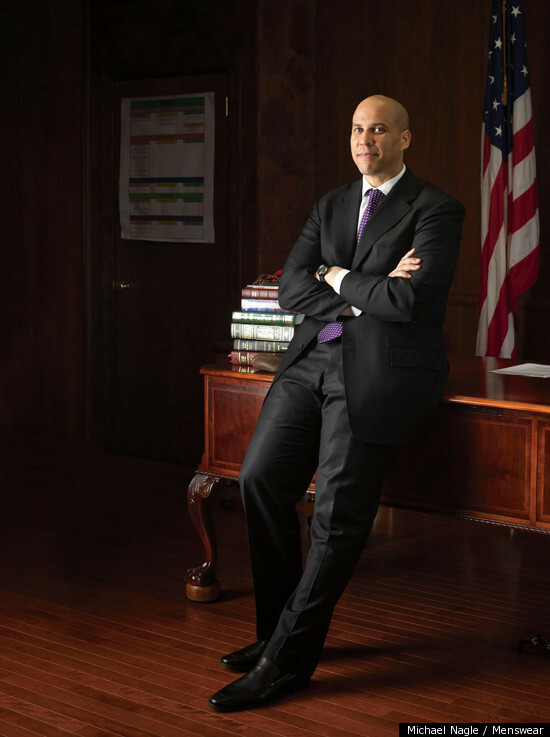 In other words, Booker is not only impeccably groomed but also stylishly dressed. Also, he co-stars in an online comic book with none other than HuffPost Style's mascot, Ryan Gosling. Is it acceptable to say we're developing our first-ever mayor crush? How does Booker stack up against Hollywood's most stylish men?